After the end of the Second World War, people felt the need to contact their fighters’ companions or camp comrades. 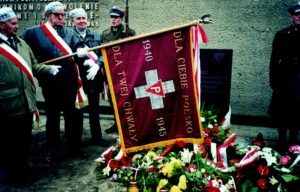 The idea of uniting prisoners in associations created a feeling of solidarity among the former concentration camp prisoners – 17.000 Polish prisoners had been deported to the Neuengamme Concentration Camp. The Polish Association of Former Political Prisoners of Hitler’s Prisons and Concentration Camps was created in 1946. Our activities after 1945 had a different start than in the countries of Western Europe. Living behind the “Iron Curtain”, it was difficult to travel, to keep contacts and to exchange opinions. In Neuengamme, the international memorial was inaugurated in 1965. During the ceremony, the former prisoner Józef Garliński (Auschwitz, Neuengamme No. 22717) held a speech. 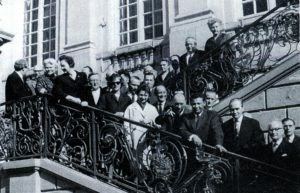 The founding meeting of the Polish Neuengamme Association took place in 1966. 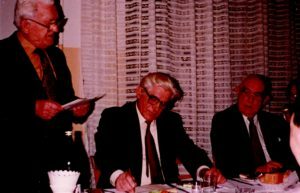 The statutes were established and the board was elected: Jerzy Stoberski (Auschwitz, Neuengamme No. 18011), Bogdan Suchowiak (Neuengamme No. 3524), Mieczyslaw Krauze (Neuengamme No. 3609). The program is based on the objectives of the Amicale Internationale KZ Neuengamme (AIN), founded in 1958. Lubeck – how can the intergenerational message be transmitted? The Neuengamme Association in Warsaw under the leadership of Zbigniew Foltynski (Neuengamme No. 60127) publishes a bulletin about its activities. We meet regularly and attend meetings and annual events. 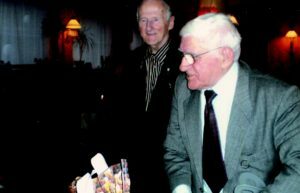 Some of the former prisoners published their memories: Bogdan Suchowiak, Józef Garliński, Mirosław Firkowski, Jerzy Giergielewicz, Stanisław Sterkowicz, Mieczysław Krauze, and Wawrzyniec Węclewicz. Survivors like Joanna Fryczkowska (Neuengamme No. 6417, Bergen-Belsen) and Roman Kamieniecki (Auschwitz, Neuengamme No. 18838, Bergen-Belsen) meet with young people in Poland and Germany and talk about their experiences. In 1973 in Warsaw there were 180 former Neuengamme prisoners and 800 in the whole country. The Neuengamme Association helped the comrades in need and suffering from the KZ syndrome, a syndrom that also affects future generations. Today, we are ten former prisoners in Warsaw and 30 in the whole country. We stay in contact with the families of our comrades. The children and grandchildren take over our duties. These descendants participate in the activities of the Neuengamme Memorial like the Forum „Future of Remembrance” or the events of the Wöbbelin Memorial. The descendants try to fulfill the expectations of the traditions of the passing generation. The last respects are given to them with the Neuengamme banner. 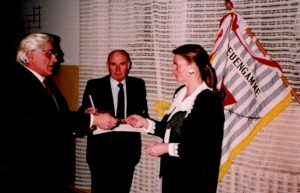 Warsaw, 1990: Jerzy Stoberski submits the Auschwitz Cross to the daughter of Jan Derengowski (Neuengamme No. 55009), next to him stands Zbigniew Foltyński (Neuengamme No. 60127).